The K-9 teams of the K-9 Patrol Unit are provide our clients with the most effective and efficient layer of security. These security officers in Illinois provide an excellent visual deterrent to crime and increase public awareness. K.P.U. K-9 teams present and maintain a positive and professional image. K-9 Patrol Unit teams have the ability to reduce your liability in multiple ways. Our officers have the proven advantage of working with highly-skilled, highly-trained security service dogs. These K-9s are able to detect threats long before they become apparent by way of their uncanny sense of smell and hearing, affording the officer greater self-protection, and provide a less-lethal alternative to firearms. With over 200 hours of training, Action K-9 Security Inc.’s K-9 Patrol Unit teams are, without a doubt, the most viable security option available to the public. 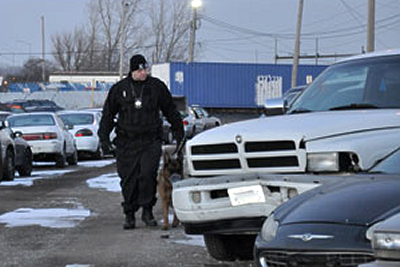 According to the Transit Cooperative Research Program, K-9 Patrol Teams have the capabilities of four armed officers. The TCRP also goes on to say that K-9s are good for public relations, supports outreach with the community and media, and provides a strong symbol for public safety. In addition, k-9s are proven to be an effective tool for deterrence and order maintenance. Customers generally like k-9 teams while criminals fear them; the preferred ingredients of an effective security option. Please Contact one of our knowledgeable security consultants to review your security needs and to recommend an optimal deployment strategy for you. Copyright © Action K-9 Security Inc. All Rights Reserved.